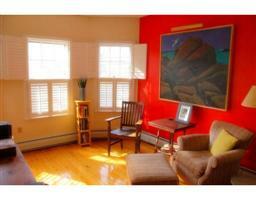 Chic, contemporary living in Jamaica Plain's artist neighborhood! Chic, contemporary living in Jamaica Plain's artist neighborhood! Take a look at this sunny 5 room, 2 bedroom condo with exposed brick walls, gleaming hardwood floors, newly renovated bathroom, large open kitchen with glass doors leading to a deck, enormous living room with dramatic, shuttered bay windows overlooking a scenic park. Deck is great for outdoor entertaining. PLUS-garage & basement storage. Steps to T, Corridor Park, Brewery complex with gym, caf?s and much more. A must see gem!